Our Website is the only one that you will need to check and find all properties listed in the MLS. Buyers start their search on the internet. 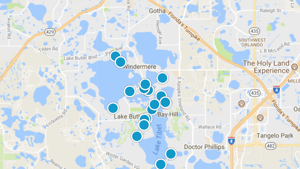 There are many sites you can use to find homes in the Orlando area. Our website is easy to use and allows you to customize your search to find the perfect home. We are experts in the local market and are here to assist you if you need assistance. Purchasing a home is the largest most expensive decision you will make in your life time. A real estate transaction can be overwhelming and our goal is to guide you, assist you with the entire process. We specialize in families finding their dream home. We are here to provide you with expert negotiating skills, experience and know how in getting the deal done. Our goal is to guide you through the process and provide exceptional service to help you acquire your dream. You have the ability to customize your search and can search for homes based on your price range, area, waterfront, or lake front homes. You can search for a pool home, home in a specific school district, gated community, and so many other options. You can search for New Construction Homes, Just Listed Homes or Just Sold Homes. We can show you all the Foreclosure properties available in the local market. Our website is updated constantly and gives you an accurate display of Active, Pending and Sold listings. Set up the search that you want and you will be able to see the list of homes that you like. Save the search by clicking on the button in the upper left hand corner. You can sort you list by price or by the newest listings. Save as many searches as you like. Our system will email you new listings that come on the market every day. If you like you can give us a call and we can customize your search and have our system send you all the listings that match your search criteria on a daily basis. We are customer driven and are dedicated in to achieving results and providing exceptional service for our Buyers. If you are in the market to buy a home, let us put our 15 years of real estate expertise to work for you. We are full time agents and can help you with the purchase of your first home or vacation home. We are also available to assist you with your relocation to a new area here in Central Florida. We have experience in helping people relocate to this area and with our relocation department. We can help First Time Buyers, Foreclosure Buyers, Short Sale Buyers, Lake Front Buyers, New Construction Home Buyers, and Town Home and Condo Buyers.